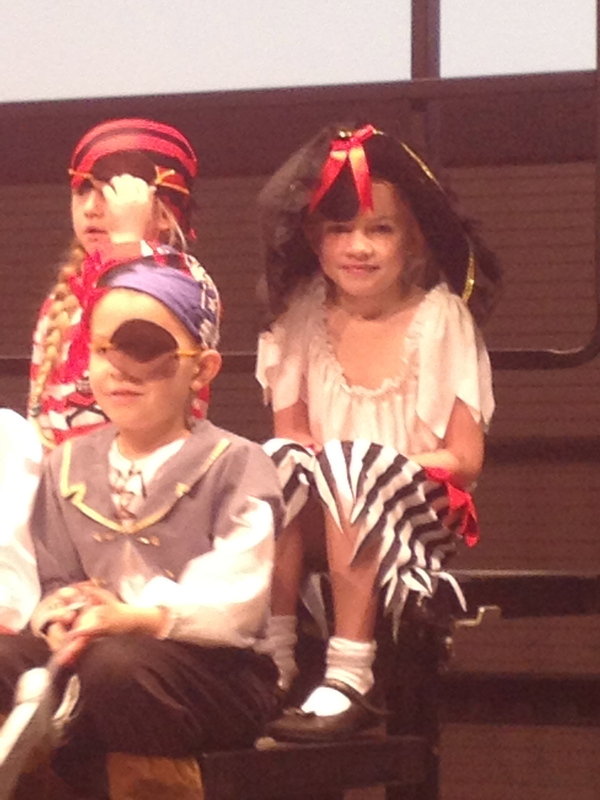 Oliver’s topic at school for the last few weeks has been on Pirates. 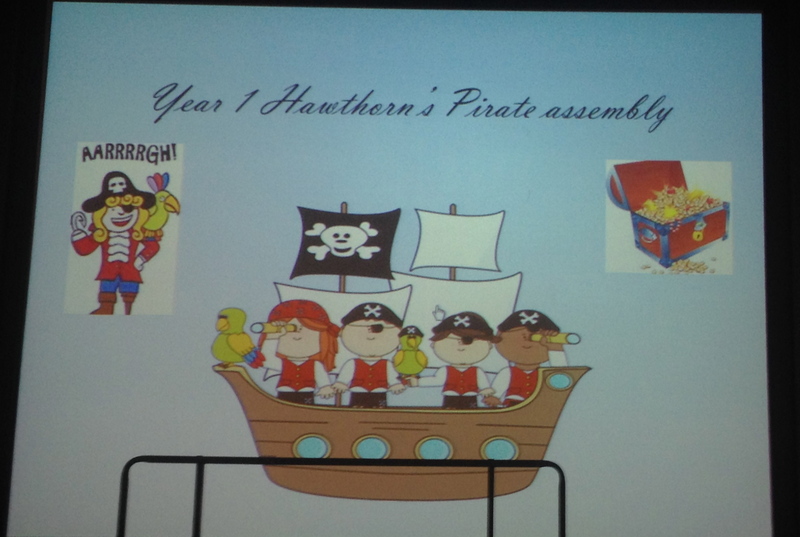 He has really enjoyed this and was excited that his class assembly was going to be all about Pirates. He came home with the script and we practiced his lines – first he would stand by the front door and recite them, and then he would race upstairs to his bedroom and recite them. He was very loud and very clear! He told us that he would be holding a microphone too. The morning of the assembly dawned and we all went in to school together. We dropped Oliver off at his classroom and saw all the cool costumes laid out ready for them to change into. Owen and I went to the Theatre to wait for the production to begin! The welcome screen on the stage. 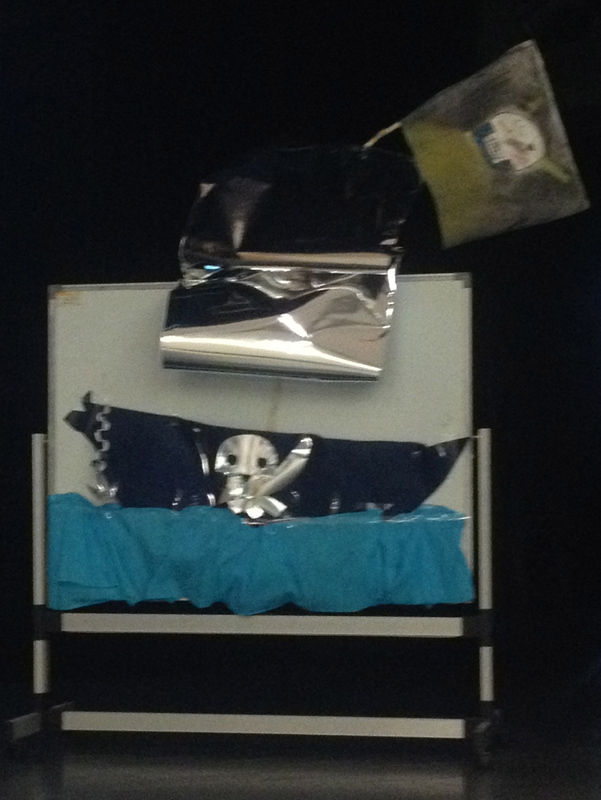 The class made the Jolly Roger boat. We had asked permission for Isabelle to come and watch and so she joined us in the Theatre just as Assembly was getting started. 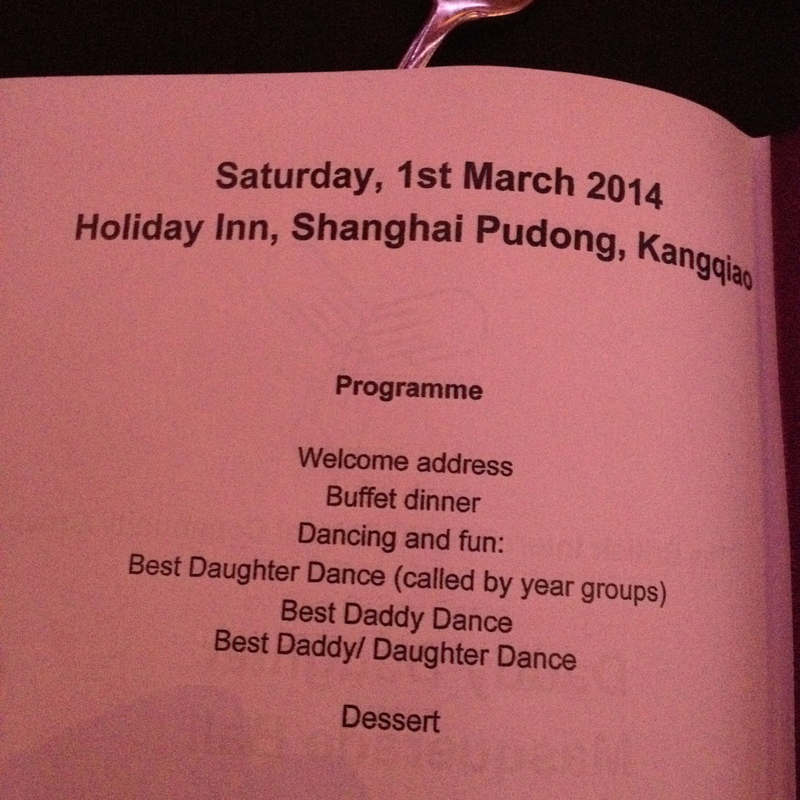 (Assembly is for Infants so it was all the classes in Year 1 and 2.) After some announcements and recognition for “Stars of the Week” it was on to the main event. 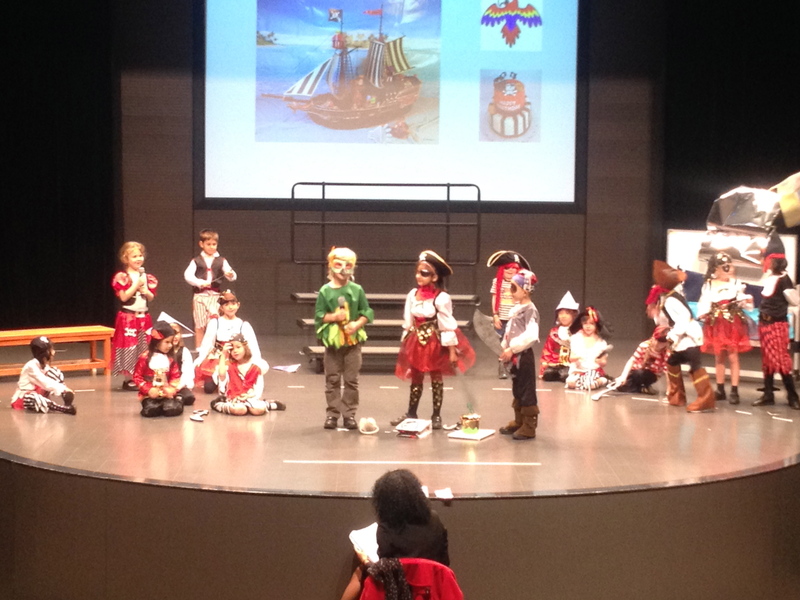 The class started by introducing themselves – with their Pirate names. Oliver’s was Long Blue Pete. 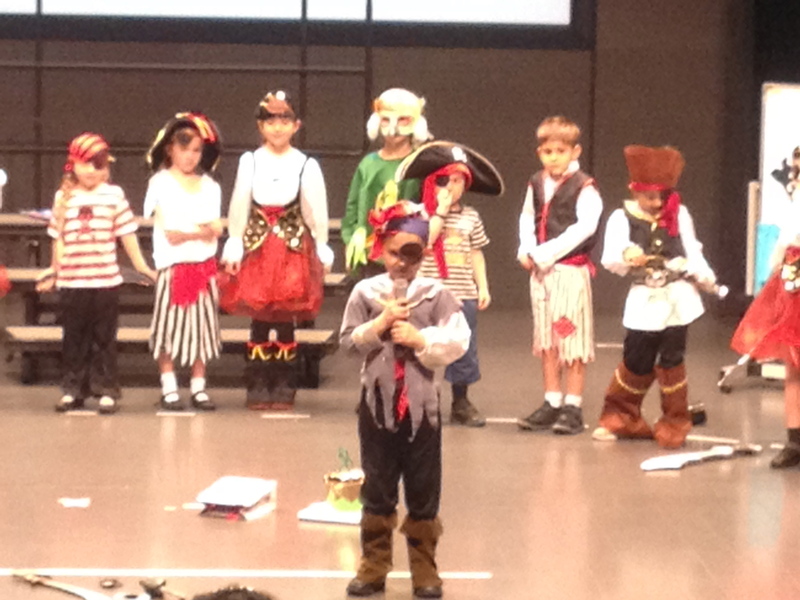 “My Pirate Name is Long Blue Pete” His teacher, Mrs Finan, is at the front. 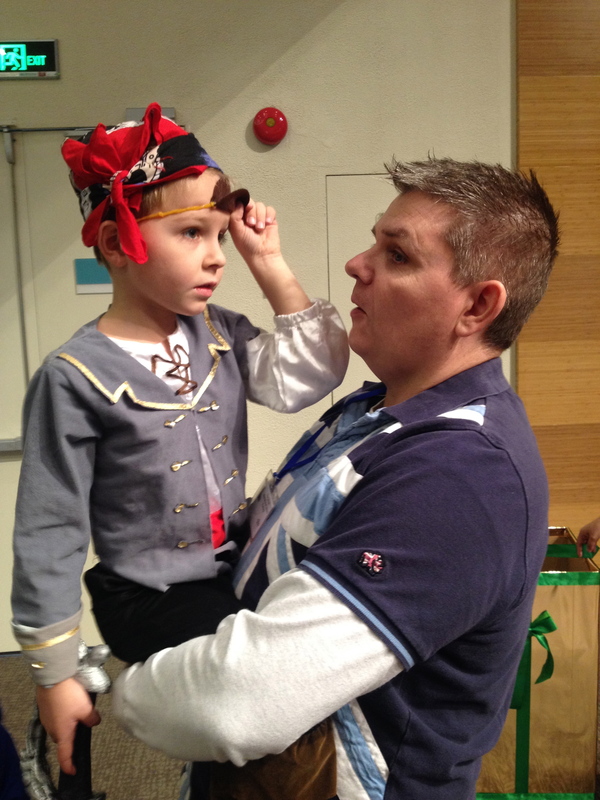 As the show went on, Owen and I were amazed to see Oliver performing more than we had practiced. All of a sudden he was also the Pirate King! 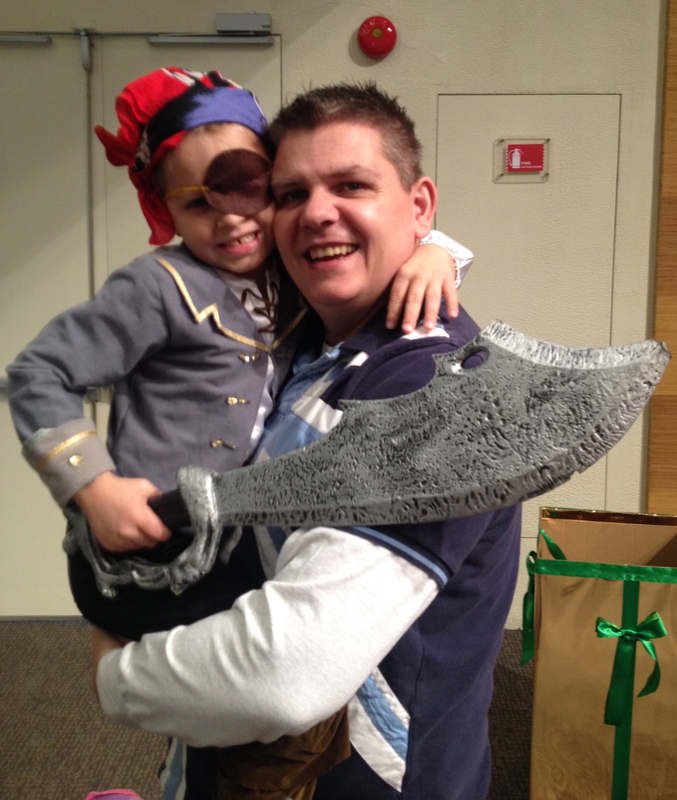 The Pirate King, AKA Long Blue Pete, is on the right delivering a birthday present to the Pirate Queen. 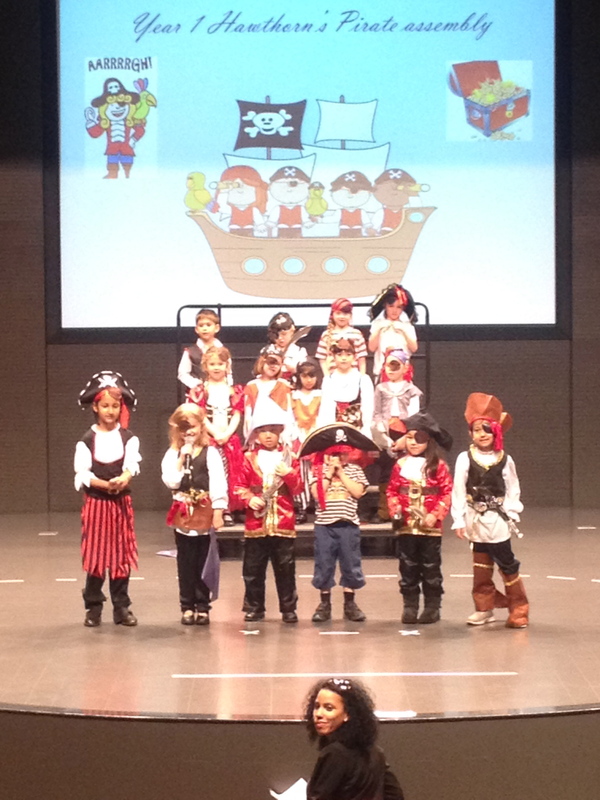 It was a wonderful performance by a lovely group of 5 and 6 year olds. They all sang beautifully, remembered their lines and obviously enjoyed being on stage. Oliver closed it out at the end with his 2 lines that we had rehearsed. 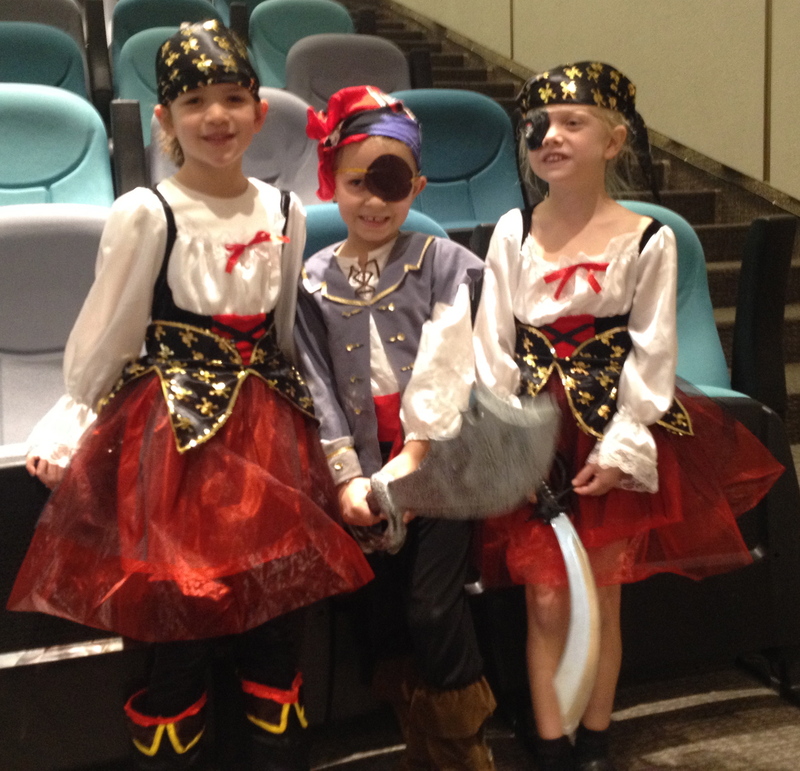 Mrs Finan told us right after that the original Pirate King was sick and she needed somebody to stand in. As Oliver had done such a good job learning the script (plenty of help from Isabelle too) she had asked him to “save the day”. He did brilliantly and we were so proud of him. You would never have known that he jumped in at the last minute. Chloe (Oliver’s special friend! 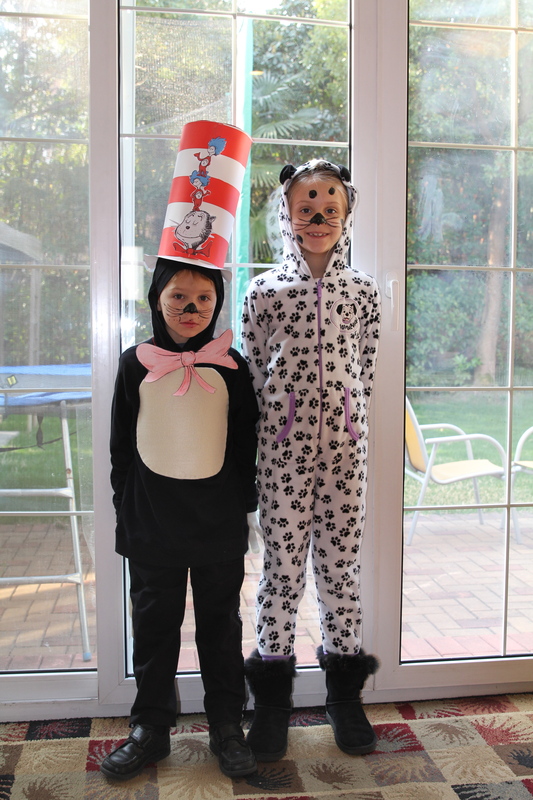 ), Oliver and Lucy. What is really under a Pirate’s eye patch? Oh – it is an eye!! 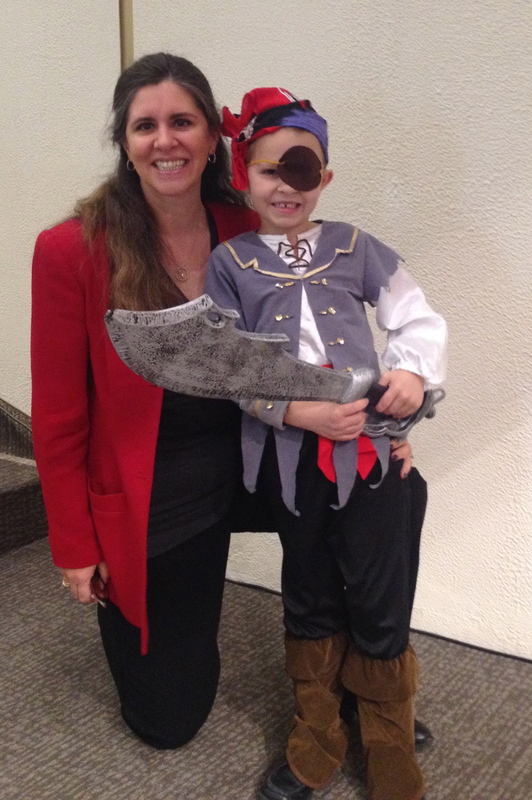 Arrrr, shiver me timbers, are you ready to walk the plank? 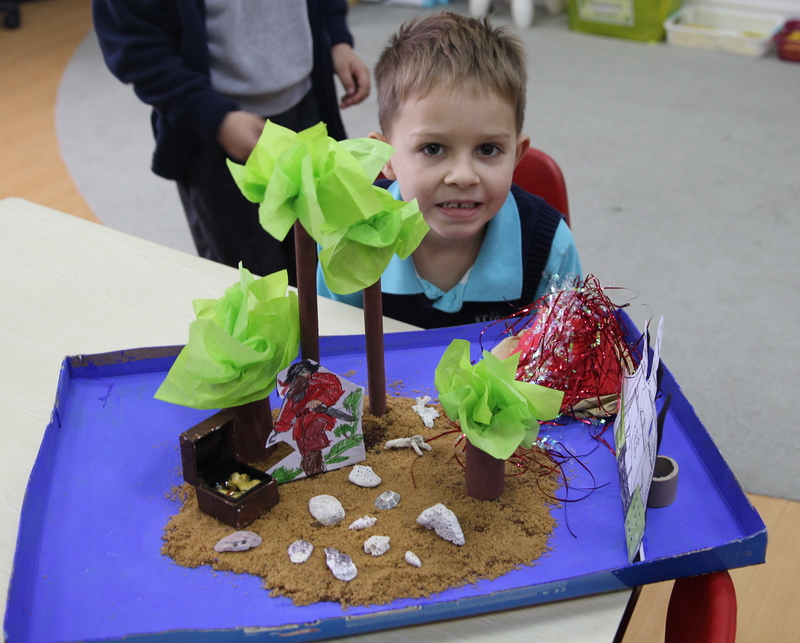 As well as practicing for the Assembly, Oliver also had a homework project to create his own Treasure Island. We had fun finding things at home to make this – he had toilet roll and tissue paper palm trees, a jewelry box as a treasure chest, painted little pebbles for gold, brown sugar for sand, a volcano, pirate ship and pirate. The finishing touch was a selection of Oliver’s shells that he has collected from our various trips abroad. He worked so hard on this and the end result looked fantastic. Oliver’s Treasure Island homework project. Today is a beautiful day in Shanghai. The sky is blue and I have a fantastic view from my office window across the city. The AQI is 63 (US Consulate) or 57 (China local monitory) – a “good” day. AQI is a daily topic of conversation among ex-Pats and locals alike. 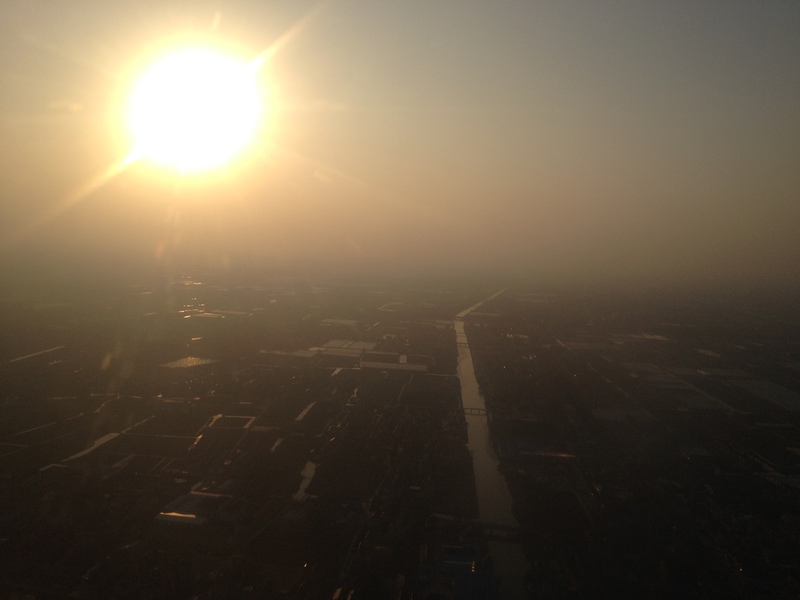 What is AQI? It stands for Air Quality Index and it is the measurement that is used for the health of individuals breathing the air every day! 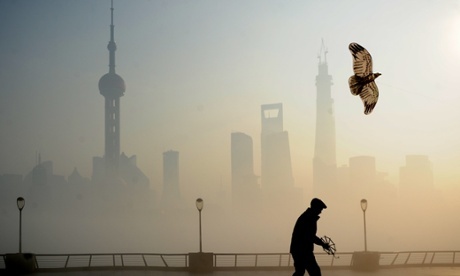 China has been in the International news quite a bit over the last few months and it is all because of the appalling smog that is blanketing this Country. Atmospheric particulate matter – also known as particulates or particulate matter (PM) – are tiny pieces of solid or liquid matter associated with the Earth’s atmosphere. They are suspended in the atmosphere as atmospheric aerosol, a term which refers to the particulate/air mixture, as opposed to the particulate matter alone. PM 2.5 and PM 10 are two types of pollution involving particles too small to see with the naked eye – less than 2.5 or 10 microns in diameter. 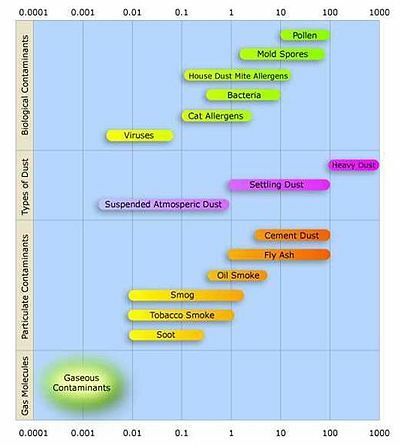 Particulate matter, or PM, is the term for particles found in the air, including dust, dirt, soot, smoke, and liquid droplets. Particles can be suspended in the air for long periods of time. Some particles are large or dark enough to be seen as soot or smoke. Others are so small that individually they can only be detected with an electron microscope. Many manmade and natural sources emit PM directly or emit other pollutants that react in the atmosphere to form PM. These solid and liquid particles come in a wide range of sizes. Particles less than 10 micrometers in diameter (PM10) pose a health concern because they can be inhaled into and accumulate in the respiratory system. Particles less than 2.5 micrometers in diameter (PM2.5) are referred to as “fine” particles and are believed to pose the greatest health risks. Because of their small size (approximately 1/30th the average width of a human hair), fine particles can lodge deeply into the lungs. Sources of fine particles include all types of combustion activities (motor vehicles, power plants, wood burning, etc.) and certain industrial processes. Particles with diameters between 2.5 and 10 micrometers are referred to as “coarse.” Sources of coarse particles include crushing or grinding operations, and dust from paved or unpaved roads. Other particles may be formed in the air from the chemical change of gases. They are indirectly formed when gases from burning fuels react with sunlight and water vapor. These can result from fuel combustion in motor vehicles, at power plants, and in other industrial processes. Often these consist of fragments of unburned fuel and are small enough to reach the lungs or, in the smallest cases, to cross into the bloodstream as well. The World Health Organization (WHO) sets a maximum safe limit of exposure over a 24-hour period: 25 of the PM 2.5 particles in every cubic metre of air. Levels above 300 are considered hazardous, while the WHO recommends a daily level of no more than 20. The Chinese government has launched an effort worth 1.7 trillion yuan (£180bn) to clean up power stations and traffic fumes. Specific measures include closing down any power stations within the city that burn coal – or switching them to burning cleaner gas instead. A new lottery system with very few winners is restricting the rise in the number of new cars and drivers. Beijing already has five million cars on its roads, and greener cars will get priority. Beyond that, a major push for renewable energy including hydroelectric, wind and solar is designed, in part, to help replace power generation by coal, the cheapest but most polluting fuel. 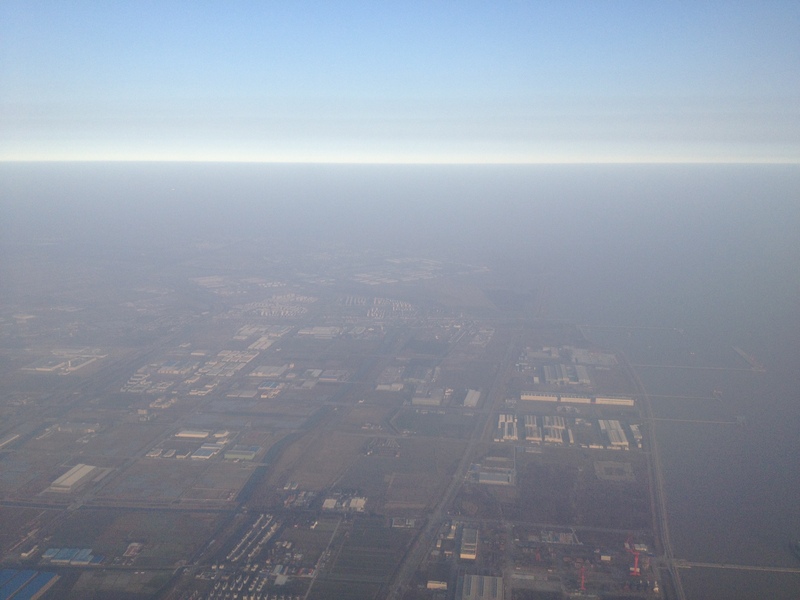 On a recent flight into Shanghai’s PVG airport, I took these photos from the window. You can clearly see the smog hovering above the city. Clear blue sky above the smog. This should have been a fantastic view for me across the city. 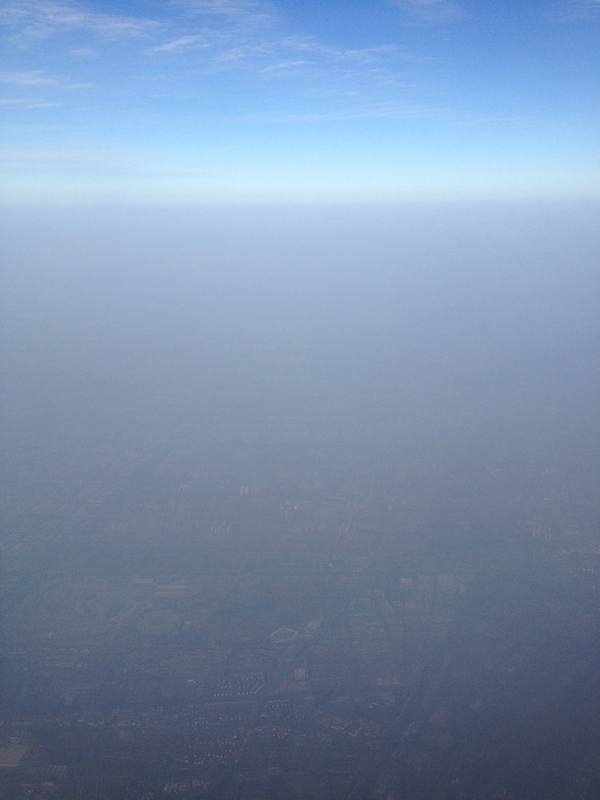 What a pity that I cannot see much below me….. Again, the line between clear blue sky and the smog can be seen. The smog is so bad that it “dims” the sun. Look at this famous skyline from just across the river. Smog is low and thick. Many days seem to be like this in Shanghai now. Last April a new health warning system was launched, and this year has been the first time that the Shanghai authorities urged residents to stay indoors and asked factories to either cut or halt production. Air quality in cities is of increasing concern to China’s stability-obsessed leaders, who are anxious to limit potential unrest as more affluent citizens turn against a growth-at-all-costs economic model that has polluted much of the country’s air, water and soil. The people are increasingly vocal….. The government has announced many plans to fight pollution over the years but has made little apparent progress. BISS cancels all outdoor activity when the AQI is too high. It is amazing that both my children refer to “Green” days, “Orange” days or “Red” days and know exactly what the implications are. Criteria: only AQI exceeds 200 based on local formal forecast. Dispensing Rule: one piece for each employee and registration is required in line with staff list. The air quality is a major concern to Owen and I and we do not let the kids play outside when it is bad. We have industrial grade air filters in each of our bedrooms and living space at home. BISS has air filters in each of the classrooms, so the school does not have to close when the AQI is too high. I believe that this is the biggest single problem for China at the moment. However, London had a similar problem back in the 1940’s and 1950’s. Once the Government there got serious about fixing it, it was fixed 🙂 There is hope for the Chinese……. BISS has been celebrating books all week. One of the highlights of the week has been DEAR – Drop Everything And Read. A teacher will pop their head into a classroom and shout DEAR. Whatever class is going on, it stops and they all start reading. They also had a book fair and all the kids had plenty of opportunity to spend their money on a wide selection of books. Both Isabelle and Oliver found a couple of books that they liked! Friday was Book Character dress up day. 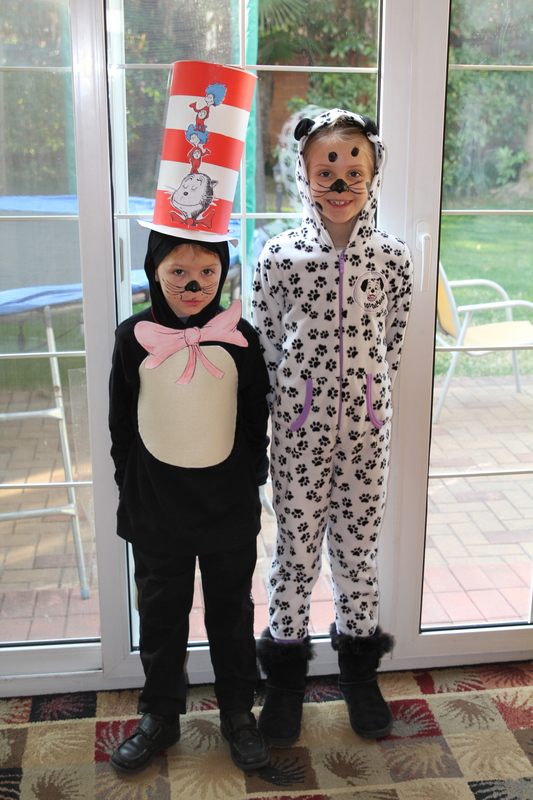 Isabelle decided to go as Rolly (one of the 99 puppies in 101 Dalmations) and Oliver was Cat in the Hat for the day. Isabelle’s costume was so easy as she borrowed some pj’s from a friend and I just painted some spots on her face. Oliver’s was a little trickier. I had originally decided to make a pop-up Dr Seuss hat, but after 2 attempts of following the instructions, it ended up as a normal hat. Even so, it was well after midnight on Thursday before I had finished!! I made him a bow tie, had some furry fur sewed onto a black hoodie and white gloves finished the look. He was so reluctant to have anything (make-up/face paint) on his face, but I persuaded him that the look would not be complete without a black nose and whiskers! 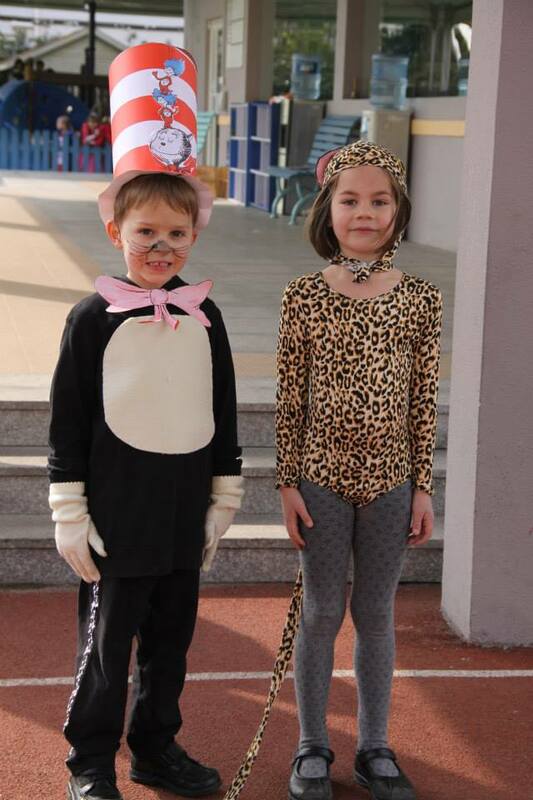 The Infants (Year 1 and 2) had a costume parade and Oliver was thrilled to win the Boys prize for best costume! Guess the late night was worth it! Oliver was a little grumpy because he didn’t want the “make up”on!!!! 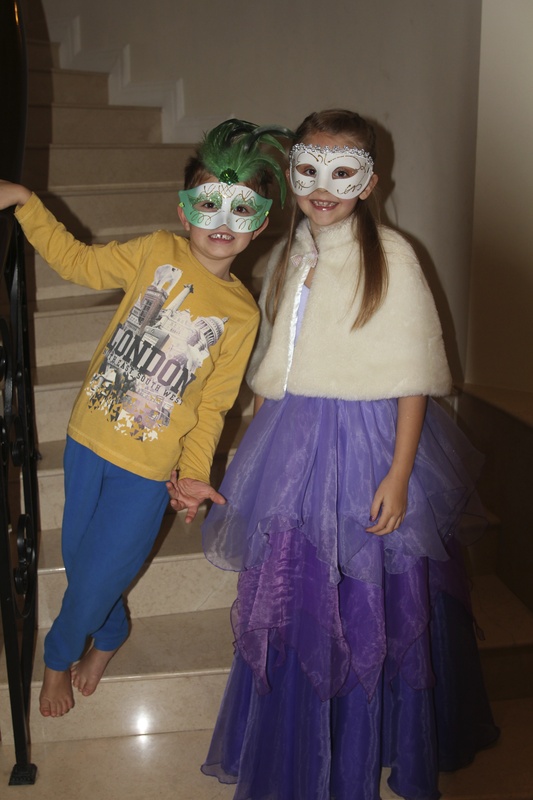 Oliver – winner of the Boys Best Costume posing with his girlie counterpart! Glad to see he is smiling this time. 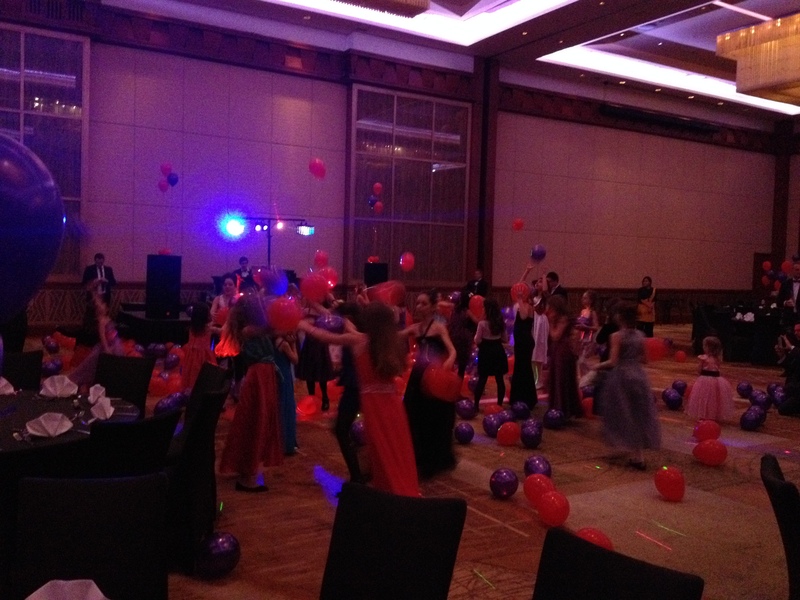 Photo is courtesy of BISS. In the afternoon we went to Maddie’s house and waited for Phoebe to arrive to paint her nails. Purple, of course! Then, we rushed around the corner to our local hairdresser’s to have her hair done. 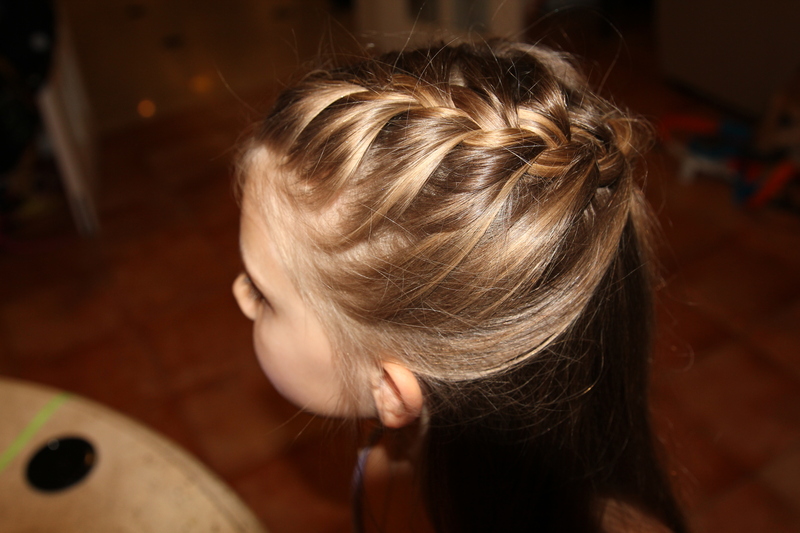 Last year she had french braids and curls, and this year she chose to have 2 french braids joining at the back and then very straight hair. Home to get dressed and put a little bit of make up on! I did some glitter eye shadow for her and pink lip gloss. 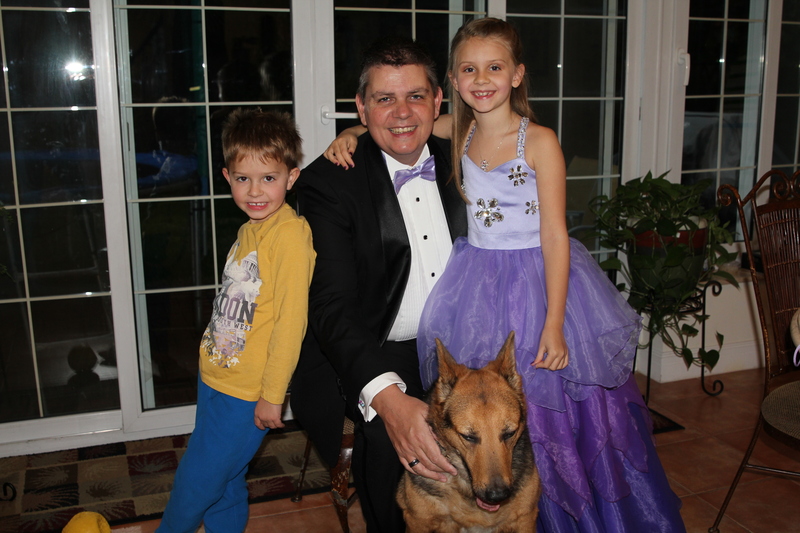 Owen was also getting ready, super-stud-Bond-like in his tux and matching bow tie. 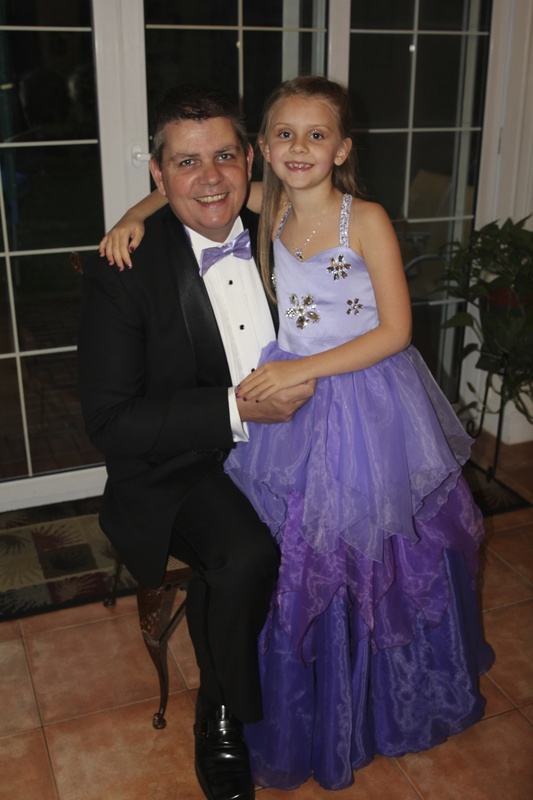 My hubby and daughter looked amazing. 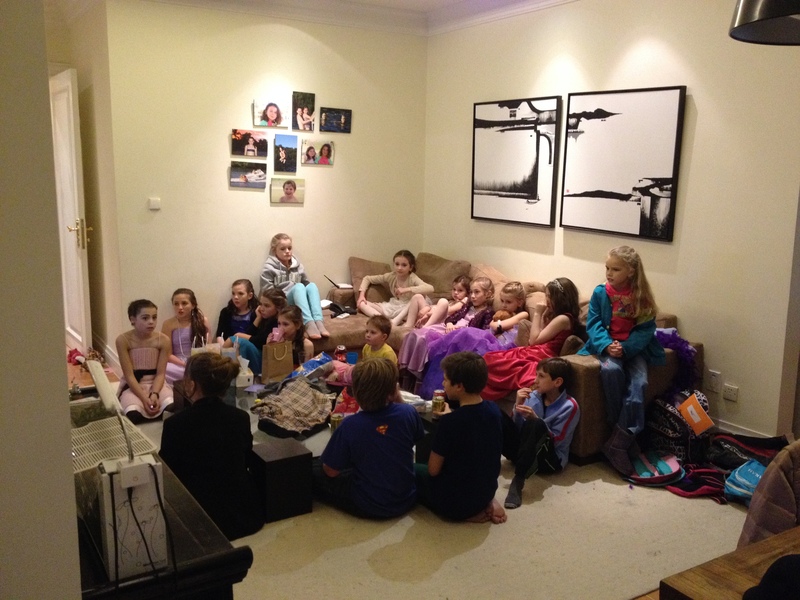 At 5:45 they left to enjoy the fun of the evening. 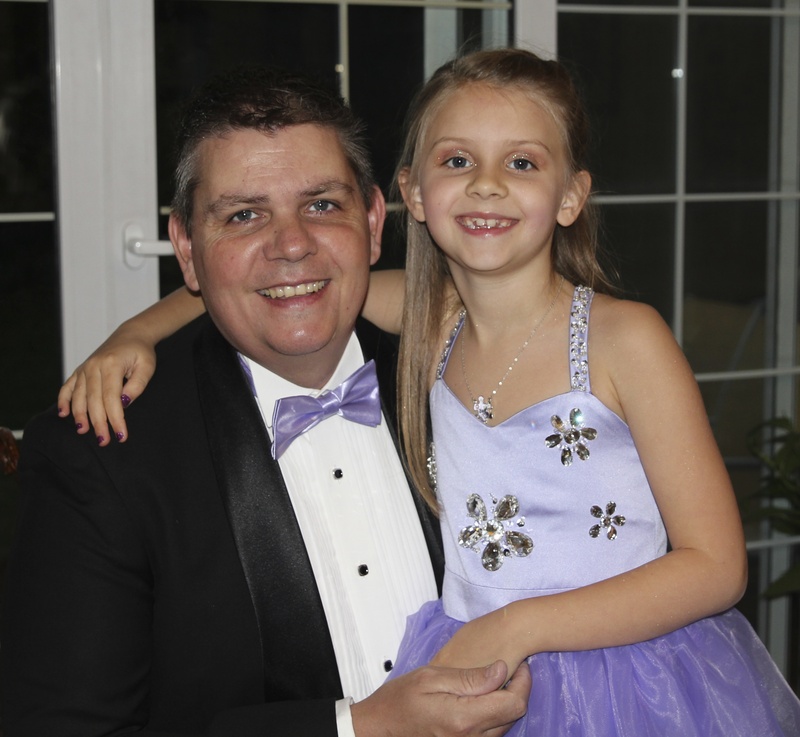 My handsome hubby and gorgeous girl. Isabelle was very specific about the detail on her dress! Oliver was testing the various masks we have at home and couldn’t resist getting in a few photos! 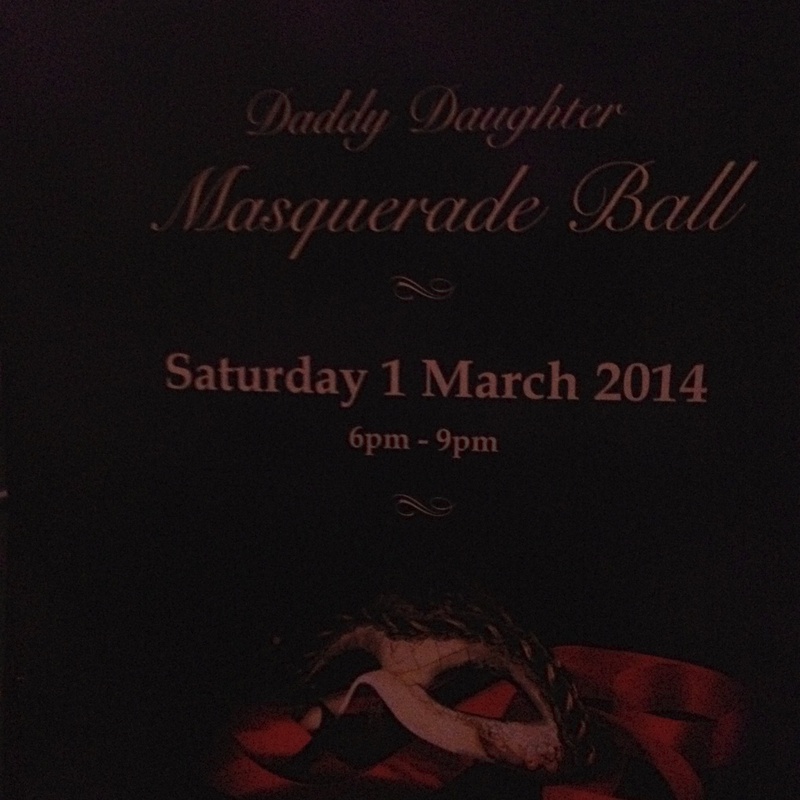 With masks on! Isabelle is ready to go with her lovely furry cape. Even Tetley got in on the action.